Following on from David Lewis’s fascinating piece about the architectural rubble spread on the beach north of Crosby promenade after the clearance of bomb damaged houses and major public buildings in Liverpool and Bootle at the end of the Second World War I send you these photographs taken a couple of years ago on the beach just south of the shingle. Like David I have tramped across the shingle to find the remnants of the large buildings of Liverpool destroyed in the bombing and once found wonder in imagining which of the buildings a remnant comes from. Looking at the photographs from the time, and to see the sheer scale of the destruction, it is doubtful that even the most brilliant architectural historian could identify the pieces; it’s enough to find them and marvel that their presence is still here. But what of the bricks, thousands, probably millions of bricks, half bricks and the grainy rubble that was once a brick that lie scattered along the beach, some still resembling the cuboid they once were, others pummelled by the tide over and over again to become a rounded pebble? What a range of colour and texture is here considering that all were created from the clay of the local area and the North Wales brick works. Following the death of a good friend who was also a lover of stones, shells and drift wood, we were asked to bring a stone to the funeral from our own area and a cairn would be built of these stones as a symbol of our love and friendship. 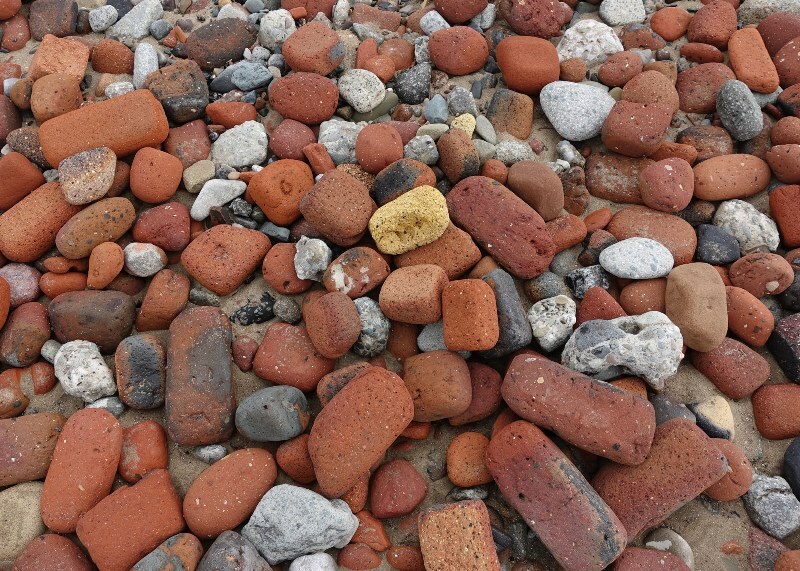 There are no natural pebble beaches on the Sefton coast; it’s all sand, so it was here, to Crosby shingle beach I came to select two very different rounded remnants of bricks to add to the cairn. And very good they looked too, bright red and orange among the predominantly grey and white stones from other parts of the country that were piled up along with them. 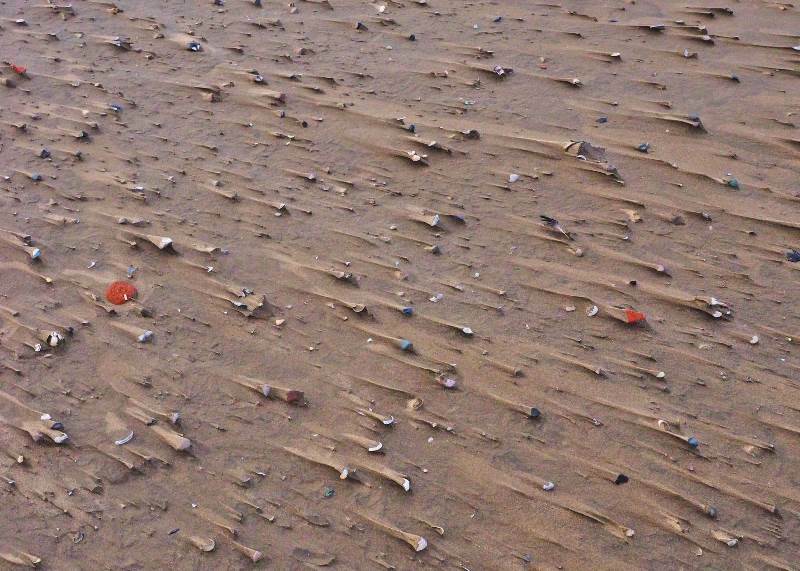 On a very windy day in February 2015 we went to walk among Anthony Gormley’s cast iron men on Crosby beach and I saw the way that the wind had carved out the patterns on the sand, blowing away the smaller grains, leaving the heavier stones and shells each with a tail of sand in the lee of the gale. The larger pieces, almost whole bricks, ended up isolated in little pools of water; a tiny moat around the brick castle. I started to look for the different colours in the bricks, the reds and browns, oranges and yellows, but also the blue and black. Was this a different band of clay? Was it crushed shale or even clinker from the iron furnaces of the day? I’ll probably never know but the colours will always remain in the bricks of the Crosby shingle beach.